When Sydneysider Matthew Clark returns to school after the summer holidays, he will have an incredible story to tell his classmates. Source: Catholic Mission. 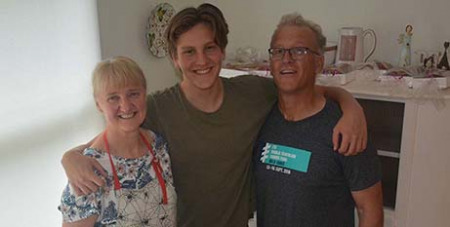 The 15-year-old will head to Myanmar next week with his parents, Vera and Stuart, to take part in the Trek to Reach Out, a 12-day adventure exploring the rugged landscape of a country steeped in history. Together, the trio will celebrate Matthew’s 16th birthday in the trip’s final days, making the occasion extra special. The Clarks are taking up the challenge – which is run by Catholic Mission and Inspired Adventures – to raise vital funds for children’s and community projects, some of which they will visit during their trip. The idea to get involved came from Mrs Clark, a long-time supporter of Catholic Mission who was inspired by a friend working in international aid in Myanmar. “He highly recommended going to the country soon, before tourism really takes off and while it is still unspoiled,” Mrs Clark said. The family has set up a fundraising page, working towards a target of nearly $10,000, funds that will support projects in education, health and community development.